← Our Sins are Washed Away and the Spirit is Poured Out! 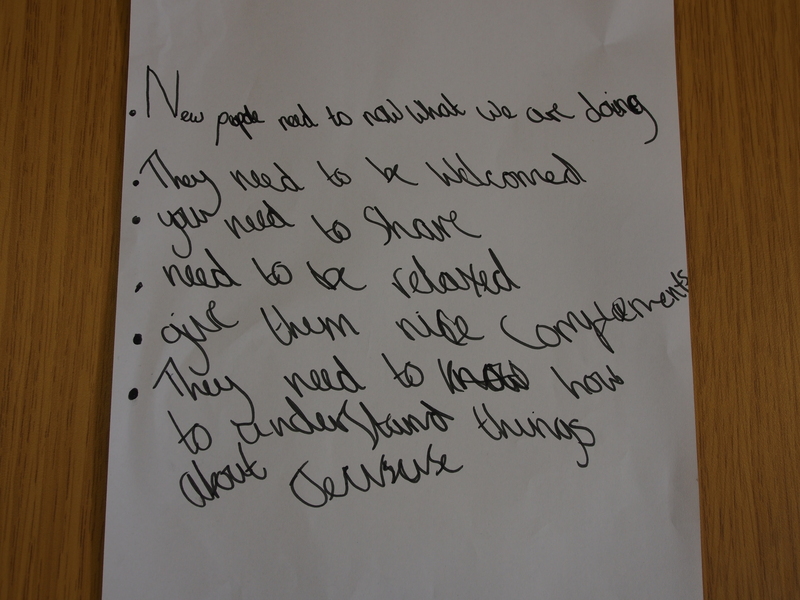 Yesterday we spent the service reflecting on our church values and at one point everyone had some space to draw, write thoughts or to discuss the values. One of the children (she is 3) drew this picture and asked her mum to write the names in of the other people in her Sunday School class. Two of our values are ‘God is our leader’ and that we are ‘travelling in a journey of faith’. 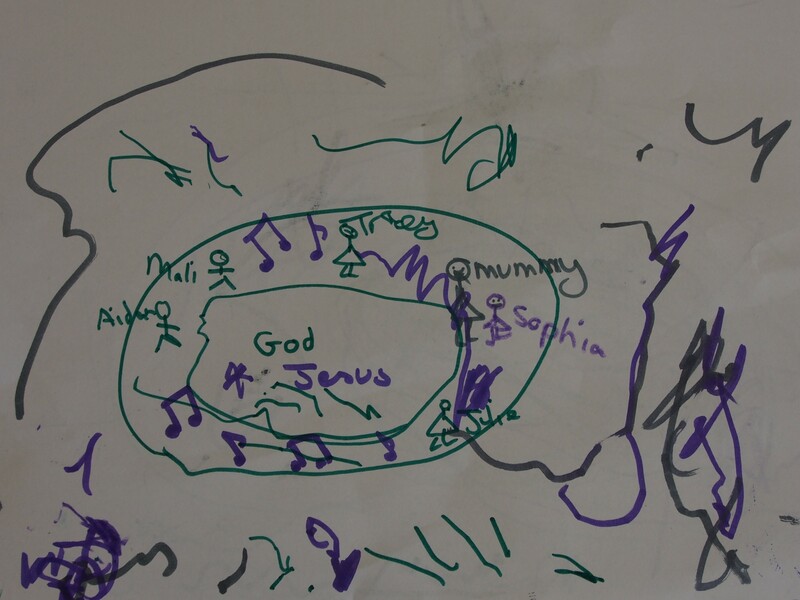 This young girl may not be able to articulate our church values, but she drew such a helpful reminder of what it means for Jesus to be with us and of the importance of us keeping him at the centre of what we are doing. 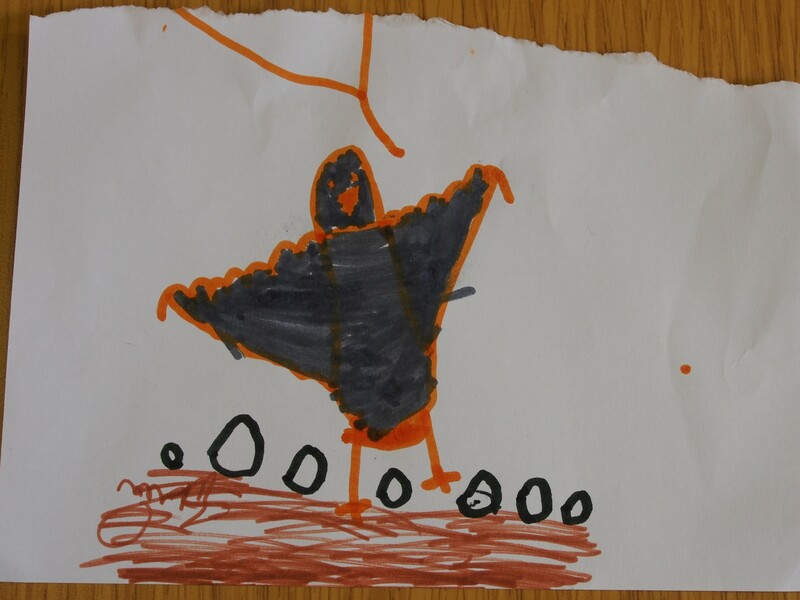 One of the other children (he is 5) drew this picture of a bird on a nest. He couldn’t explain why he had drawn the picture, but it was a helpful illustration of ‘everyone matters’ which is another one of our values. We had also spoken about how we welcome people and show love to one another and this was very much evident in this image. They need to know how to understand things about Jesus. (Another one of our values is being honest about our faith). I love the way that she explained some our values so clearly whilst also challenging us about how we can implement them. I feel that needing to share what we have, was an especially insightful and helpful comment. Do we have too low expectations of children? Do we expect children to be able to be inspired by God and to have something worthwhile to say, even if they are only 3? If we don’t create space for children to share what they are learning and what God is saying with the wider church then we will miss out! This entry was posted in church, discipleship, Faith, Learning, Life experiences and tagged christian values, creative learning, explaining discipleship to children, God of surprises, how welcoming is the church, inspirational, interactive learning, learning through fun, life experiences, surprised by Jesus, unless we become like children we cannot enter the kingdom of heaven, we need to stretch our children, wecloming people in church, what is the church for, when children surprise us. Bookmark the permalink. Children often have some great insight because they do not allow the cares and experiences of this world to change their simple faith. God can use anyone to touch lives and bring His message through. Thanks for sharing that great experience with children. Explore Together is a resource published by Scripture Union which seeks to fully engage whatever their age, stage of spiritual experience. It creates a safe environment for people to hear from God and learn from each other just like the examples outlined in this article. It encourages people to use their natural, God given character, skills and preferences to explore what God is saying to them through the Bible therefore being totally inclusive. It allows the youngest child, the most seasoned Christian, the new seeker and those who struggle to engage to share together in a way that values everyone. Check out the website for more information, it could be what you’re looking for.